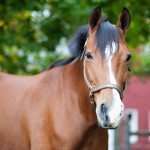 Description: Born in 1999, Madison is a beautiful 16.3 hand blood bay mare with a stripe and unique snip. Personality: From the moment she arrived, Madison established herself as the sweetheart of the barn! She is very motherly, gentle, and easy to work with. She is a hard worker in the ring, though she’ll make her rider work right along with her. History: She resided in Florida during her younger years, competing as both a Children’s Jumper and a Junior Hunter. After she moved to the northeast region, she continued to show successfully before arriving at NCMT in 2010.